RICHARD BATTISHILL was born towards the end of 17th century, in the reign of William and Mary. He married in Moretonhampstead in 1716 and raised his family there. The Exeter baptism is further away from Moretonhampstead than the others, and people commonly moved into cities rather than out of them. The Throwleigh baptism raises the question of whether the son of the unmarried Anne Battishill would be a suitable bridegroom for the daughter of a well-to-do yeoman. At first sight, this is possible, since the couple’s own son John married the fatherless Joan Nosworthy. But closer examination of the Throwleigh registers shows that this was not an isolated lapse by a girl from a good family. Richard was Anne’s fourth child, following Jane in 1676, William in 1680 and Isett in 1685. This almost certainly means that Anne Battishill of Throwleigh was a prostitute. It is much more likely that Elizabeth Hamlyn’s husband was the one baptised in South Tawton. If this supposition is correct, then he was the son of Richard Battishill and Elizabeth Reeve. He was the sixth child of seven. Two previous babies were christened Richard and must have died, though their burials have not been found in the register. He had three older sisters and a younger one. As the only surviving son, he would have meant a great deal to his parents. There was a prestigious family of Battishills living at West Wyke in South Tawton. Their pedigree and coat of arms are listed in the Heralds’ Visitations. Richard’s father does not seem to have been born in South Tawton, and no connection has been found between him and the gentry at West Wyke, but it is likely they were related, however distantly. There were also Battishills in neighbouring Drewsteignton. In the early 18th century, Thomas Battishill, gent, and his wife Aphra were worshipping at South Tawton church. Aphra died in 1727 and Thomas in 1728. Wall plaques, bearing the Battishill coat of arms with four owls, commemorate their deaths. Richard could also be related to this branch. We do not know if Richard was living in Moretonhampstead before his marriage. Since he was only 17 at the time, quite possibly not. Seventeen is unusually young for a bridegroom, but since the bride was only thirteen, it is here quite plausible. It suggests the couple were from well-to-do families, and could count on support until they reached maturity. The Battishill surname first appears in Moretonhampstead in 1667, 50 years before Richard’s wedding, with William Battishill, churchwarden, who was literate. In 1680 Andrew Battishill married Anna Bickley. They had their daughter Susanna baptised at the Presbyterian Cross Street Meeting in 1682 and their son Nicholas in 1683. 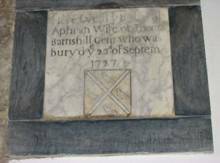 This is followed by the marriage in the parish church of Richard Martin and Anne Battishill in 1685, and the burial there of Nicholas, son of Andrew Batttishill in 1691. There are no further records of the Battishills at Cross Street Meeting, nor at the parish church until Richard and Elizabeth’s wedding in 1716. Since there are some gaps in the Presbyterian registers, Richard could have been another child of Andrew and Anna of Moretonhampstead, whose baptism has been lost. However, he had his own children baptised at the parish church. Since the Richard of South Tawton does not appear to have been buried, married or had children christened in his home parish, a move from there to Moreton would fit the evidence well. He may have gone there to work for a relation. ELIZABETH HAMLYN was the daughter of the yeoman farmer William Hamlyn and Elizabeth Adams. There were Hamlyns in Moretonhampstead at least as early as the 16th century and an even larger number in Widecombe in the Moor. We do not yet know how far back Elizabeth’s family go in Moreton, but her parents married and had their children baptized there. She may have spent her childhood at Willowray, a farm on the road from Moreton to Bovey Tracey, which follows the Wray Brook. Her parents were living there three years after her marriage. Elizabeth was married in 1716 when she was only 13, which is unusually young. There is no sign that she was pregnant, to precipitate a wedding. Her first child was born a year later. Baptisms. Moreton Hampstead. St Andrews. Mary was buried on 2 August 1732. James was buried 11 April 1742. A high percentage of these children survived infancy, reinforcing the impression that the Battishills, like the Hamlyns, were not one of the poorest families. They were not gentry either. Richard is never described as ‘Mr’. Elizabeth died in 1746, aged 43. Richard may have outlived Elizabeth by 24 years, though this burial could be his son. The spelling of the surname in the registers changed in the late 1750s. 1770 Novemr 27th was Buried Richard Battershill.